This year, an estimated 160,340 people will die of lung cancer in the United States alone. And about 226,160 fresh cases of this cancer will be diagnosed during the year. It is very important to be aware of common lung cancer symptoms - early detection is critical to improve the odds of survival. Of the 200+ different types of cancers known today, cancer of the lung is by far the leading cause of cancer deaths across the world. It is one of the riskiest diseases around because it has a tendency to spread to other key body organs very quickly. That's why it is important to know common symptoms of lung cancer. Like other types of cancers, lung cancer occurs because of the abnormal functioning of the basic unit of life in the body - the cell. Healthy cells are programmed to divide and reproduce in an orderly manner which serves the body well. There is an elaborate control system built in which takes care of this reproduction. When this delicate balance is upset due to a number of factors, a group of cells may lapse into an unhealthy state where they reproduce and divide in an uncontrolled fashion. Moreover, old cells which would normally die off don't do so. These two factors give rise to an abnormal mass of growth in the body called a tumor. Every tumor is not malignant - many are benign. They are not life-threatening and often do not need surgical removal. They do not spread to other tissues around them or to other parts of the body. In other words, benign tumors are non-cancerous. As opposed to these benign varieties, cancerous tumors like those of lung cancer are highly malignant. Such tumors may be removed surgically, but they often grow back. They spread aggressively to nearby tissues as well as other critical body organs which may be distant from the site of the original tumor. This process whereby such abnormalities spread to other areas of the body is called metastasis. The problem with lung cancer is that the process of metastasis kicks in at an early stage of the disease. This usually happens well before the person concerned is aware of the existence of the original lung tumor. 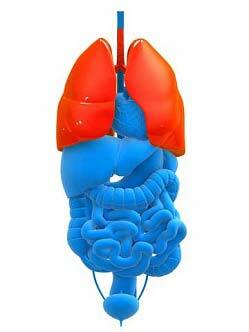 Some organs like the brain, liver, adrenal glands, etc are particularly prone to being affected by lung cancer's metastasis, although any body part can be affected. Once it has spread across the body, it obviously becomes extremely difficult to treat or cure. This accounts for the high death rate associated with lung cancer. Now you can see plainly why it is important to be aware of warning signs of the disease. You'll find a list of symptoms of the disease below. Do keep in mind that no such list can be comprehensive - these are just some of the commonly observed indicators. There could be many more. A repeated tendency to go down with bronchitis, pneumonia, etc. Spit that has a brownish tinge. Blood-stained sputum is another symptom. Remember, the presence of one or more of the above symptoms does not mean that the person concerned has cancer. Plenty of other diseases produce these symptoms as well. Having some of these symptoms does mean that a doctor should be consulted at the earliest. He or she can do the necessary investigations to get to the root of the problem. In any case, do keep these common indicators of lung cancer in mind. Lung cancer can spread to other areas of the body by breaking away from the original tumor and traveling through the bloodstream or via the lymph nodes. At some point, they may fixate themselves on other body organs and grow there. This can cause significant damage to the organ the cancer cells attach themselves to. A key fact is that even when they spread to other areas of the body, the cancerous cells are in fact lung cancer cells. For instance, if they attach themselves to the liver, they grow as malignant lung cancer cells and not as cancerous liver cells. Hence, metastatic lung cancer is treated as lung cancer, irrespective of where it has spread to. It is not treated as liver cancer, bone cancer, etc. Once the cancer has spread to other parts of the body, it may give rise to other symptoms as well. For instance, recurring headaches that don't go away, bones that seem to be too fragile and break easily, blood clots forming in the body, unexplained pain in some area, etc. Unfortunately, many symptoms do not manifest till the cancer has progressed to Stage 4, which is an advanced phase of the disease. The two main types of lung cancer are small cell lung cancer and non-small cell lung cancer. In the former type, the malignant cells look small when examined under a microscope and in the latter type, they look larger. Hence their names. About one in eight people have small cell lung cancer. This is the more virulent and aggressive of the two types. Most of the rest have non-small cell lung cancer, which does not spread as fast as the other type. The two variations of the disease are treated differently. Once some of the common lung cancer signs are observed, the doctor may make use of a CT scan, MRI, bone scan or PET scan to investigate further. Other types of tests may also be used. For instance, the doctor may remove small samples of lymph nodes to evaluate whether cancer cells have spread away from the lungs. Researchers estimate that fully nine out of ten cases of lung cancer would not develop if the patient were a non-smoker! Smoking is the number one cause of lung cancer. And by far. Second-hand smokers are also at high risk of developing the disease. Make sure you do not expose yourself to second-hand tobacco smoke. Other than smoking, asbestos exposure is also known to cause lung tumors. Studies have shown that asbestos workers are as much as seven times more likely to develop this disease in comparison to the overall population. Air pollution may increase the risk of lung cancer somewhat. Having a family history of any type of cancer may increase the risks, as will certain toxic chemicals and some lung diseases. Do gender differences exist in signs shown? In many diseases, the symptoms that men exhibit may be somewhat different from those shown by women. This may be the case with heart diseases, for example. However with lung cancer, most of the time, it gets detected only at a highly advanced stage, after it has spread to other areas of the body. This is especially true of small cell lung carcinoma, although such metastasis can also occur in non-small cell lung carcinoma. By that time, both men and women tend to show very similar symptoms. For instance, loss of weight, unexplained pain in the chest or some other part of the body, loss of appetite and so on. Thus in practical terms, there aren't major differences between men and women when it comes to signs of lung cancer. The National Cancer Institute reports based on 2007-2009 data, close to 7% of people born today will end up with this disease at some point in their lives. Put another way, as many as 1 person out of 14 will be diagnosed with this cancer over their lifetime. That's a very high rate of incidence for a disease with low survival rates. Don't be a statistic. Take proactive action and do everything you can to prevent the onset of this disease. If you are a smoker, make a decision to quit the habit. Get all the help - including professional help - you need to quit permanently. As repeatedly stated here, detecting this disease early is the key to surviving it. Further, even in cases where the cancer has progressed beyond an early stage, detecting it as soon as possible will improve chances of survival and enhance quality of life. And do remember that if you suspect you have any of the common lung cancer symptoms, you must see a doctor without delay to confirm or deny the presence of this disease.